The Danish Ambassador to Japan, Franz-Michael Skjold Mellbin, his wife Eva and a Japanese fan of Danish football. 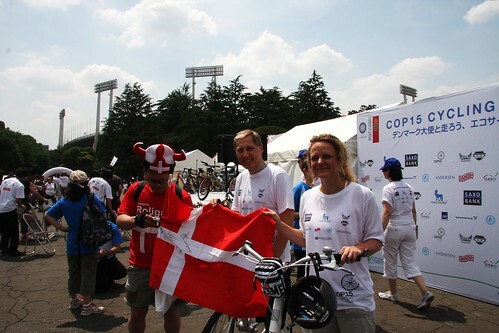 The Danish Embassy in Japan is wrapping up an ambitious project - The COP15 Cycling Tour of Japan - in order to generate support and awareness about the importance of the COP15 UN Climate Conference in Copenhagen in December and using the Dreams on Wheels Exhibition as a springboard. Which is why I was invited. The Danish Ambassador to Japan, Franz-Michael Skjold Mellbin, is the driving force behind the project which involves in all 10 stages throughout Japan. On the first day hundreds of cyclists were invited to ride 40 km through Tokyo. We stopped at various locations to greet dignitaries as well as picking up more cyclists at the Swedish, British and EU embassies. 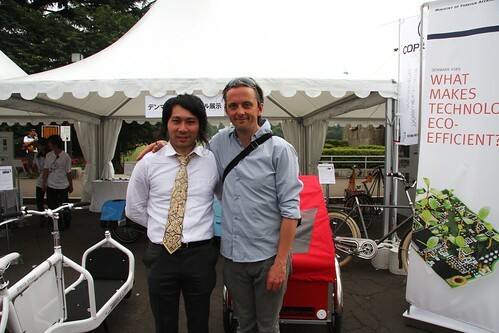 The Tokyo ride ended in an event area in Gaien Mae where there were stands for various Danish companies and Japanese orgs, a round-table discussion with the ambassador and an all-round good time. 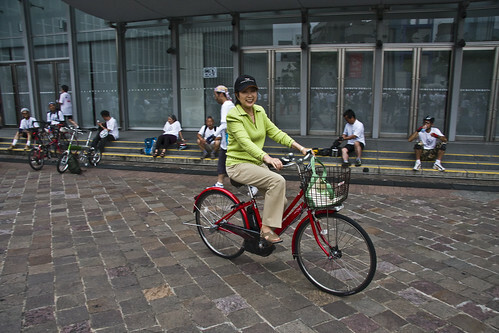 Yuriko Koike, former Minister of Defence and of the Environment joined us on the ride through Shibuya in Tokyo. She is main player in Japanese politics and many suggest that she may become the country's first female prime minister at some point. She looked fashionable and relaxed as we wove our way through traffic. After 35 km we ended up in the event area but then took a quick little 5 km trip around the Shibuya area, where we picked up Yuriko Koike, among others. So it was time for a group photo of those who took the extra trip. With a Bullitt in the foreground, bien sûr. The Japanese Cycling Association helped arrange the rides in the different cities and they are an association for hobby cyclists - thus the emphasis on 'cycling gear' which really is hardly representative of the vast majority of Japanese cyclists who use the bicycle for transport. But they were brilliant with their organising capabilities and their enthusiasm and the trip wouldn't have been possible without them. The Embassy provided me with a Velorbis Scrap Deluxe [just like being at home] for the Tokyo ride. It was a pleasure to ride my 'own' bike through the hilly landscape of the thriving city. At the event area I hooked up with my mate Hiro, who is the Japanese distributor for Danish bicycle brands Velorbis, Larry vs Harry, Christiania Bikes and Pedersen. He provided me with a Bullitt on which I rode on the Shibuya section of the ride. It was amazing to see how many heads turned in the city when the Bullitt glided past. 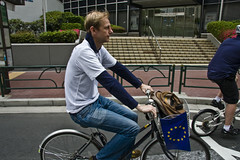 The EU ambassador to Japan checks out the source of funny sounds coming from his wife's bicycle and, not surprisingly, this Dutch chap from the EU office rode in his regular clothes on a brilliantly anonymous bicycle. Just like being at home. We stopped at the British embassy to pick up a flock of Brits who rode with us through the busy streets. The whole event was covered thoroughly in the press. 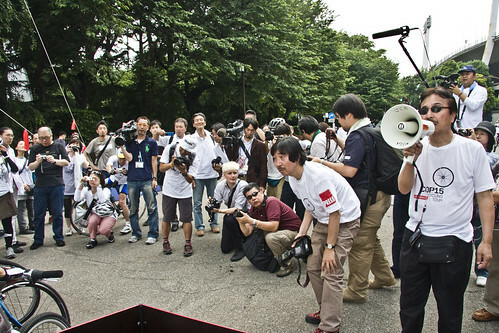 The start line of the Shibuya section was a beehive of journalistic activity. 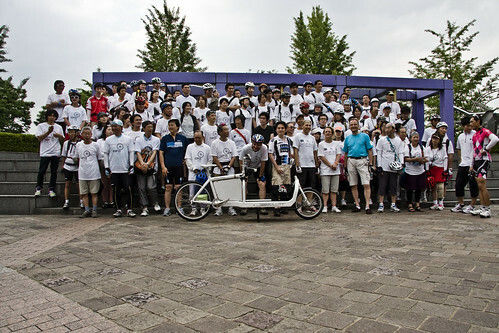 The COP15 Cycling Tour of Japan continued on to 8 other Japanese cities. Each stage involved a 30-odd kilometre ride and ended in an event area. It was amazing to see how much interest the Cycling Tour generated. Good publicity for COP 15 and, not surprisingly, for Denmark and Danish bicycle culture. The 10th and final stage takes place in Copenhagen on June 14th, 2009, where the Danish ambassador to Japan and the Japanese ambassador to Denmark join the crowds for a cosy bike ride around the city.